When Neil Wagner was growing up, he looked forward to the day he would be able to rattle international batsmen. He may not have thought about which batsmen specifically but few schoolboys do. Yesterday, he was required to target the New Zealand line-up. Yes, New Zealand. His adopted country. In the hope of preparing Martin Guptill and co. for the hostile South Africans, New Zealand's management asked their pack to bound in hard and show little mercy. Wagner did that best and his aggressive net performance could have a dual benefit. New Zealand's batsmen were sufficiently stunned and Wagner may have taken a few steps forward as far as selection for the second Test goes. After New Zealand's heavy loss in Cape Town, Brendon McCullum hinted they would shake things up. Although batting was their weakness, New Zealand don't have many options and can only replace Guptill with BJ Watling at the top and bring Colin Munro into the middle order. McCullum said they are unlikely to do that though and if changes come, they will instead be in the bowling department. Jeetan Patel could make way for Bruce Martin as the spin option while swapping the pace men is not out of the question either. Although Chris Martin came back strongly in Cape Town and finished with three wickets, Wagner was bubbling under the surface and the possibility of a second left-armer combined with his practice session poison could see him make a Test return. Wagner has only played two matches for New Zealand, after being talked about as the next big thing. Shortly after he became eligible for the country in early 2012, he was included in the squad to tour West Indies. 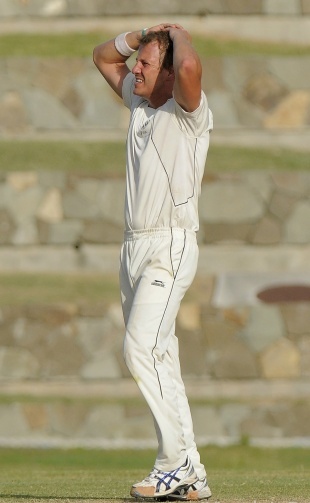 His first Test, in Antigua, was a tough outing that yielded only 1 for 144. He followed up with three in Kingston and felt a little more comfortable at the highest level. "Playing Test cricket was everything I've ever dreamed of, especially after the process of moving to Otago, qualifying for New Zealand and then getting picked. As soon as that happened, it was a mountain off the shoulders," Wagner told ESPNcricinfo during the New Zealanders tour match in Paarl. "But it was also a learning curve because I'd never played in the West Indies before and conditions were way different to what I was used to. It was two pretty tough Test matches and we didn't do as well as we wanted to." New Zealand lost both matches and Wagner was one of the casualties of the aftermath. He was dropped from the starting XI for New Zealand's India and Sri Lanka tours because he lost ground to Trent Boult, although he toured on both occasions. Now he is in contention again and senses that he is starting over, again. "It feels like the same road again and where another opportunity comes, I will have to grab it," he said. Wagner knows what it's like to let chances go begging. When he lived in South Africa he was given limited time with the Titans franchise and because he was competing with the likes of Dale Steyn, Morne Morkel and Andre Nel, when he didn't set the world alight, he was discarded. "It was tough team to break into. I wouldn't say I grabbed my chances at the Titans that well. You've got to grab every opportunity that comes your way." If he plays at St George's Park, Wagner will join the likes of Kevin Pietersen and Kruger van Wyk as players born and schooled in South Africa who go on to play international cricket elsewhere. For the South African side, it will be nothing new even though Wagner had AB de Villiers and Faf du Plessis as classmates at the Afrikaanse Hoër Seunskool (Affies). Wagner and du Plessis remained friends since and would catch up when they played club cricket in England. Now, they will meet on opposite sides having had contrasting fortunes in Test cricket. While Wagner's career has stalled, du Plessis took off in Australia but Wagner holds no hard feelings. "It's awesome for Faf to do that well and make that step. I know he has also had his trouble in the past with taking his opportunity," Wagner said. "I've always enjoyed playing my cricket with him; it's just going to be a different thing playing against him." It will probably be different for Du Plessis as well as Wagner suspects he may know the extent of which Wagner has changed. He claims that he is no longer as hot-headed as was at Affies because New Zealand has turned him into a mellower and also more thinking cricketer. "At Affies, I found that they tried to grow people up real tough and to be hard. There's no room to be soft. "The Kiwi lifestyle is a lot more relaxed and chilled; it's less aggressive. Guys at Affies hate losing and when they lost they did not accept it at all. New Zealand is calmer. I learnt how to control my emotions more and accept that on the days when it didn't go well there's nothing you can do except learn from it and become better." In keeping with that, Wagner will look to apply the lessons from his first Test stint if he gets a chance in South Africa. "It's about being more aware, adapting to conditions earlier and knowing your role," he said. "Luckily its conditions I am familiar with. There will be a touch more bounce and pace and it's all about which bowlers will stay patient the longest." Given the amount of waiting Wagner has had to do over his career, he hopes one of those bowlers will be him.